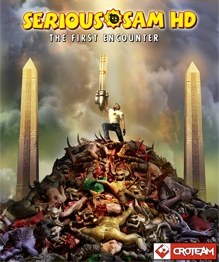 Serious Sam HD: The First Encounter was delisted from Xbox Live Arcade by approximately January 17th, 2015. It was also included in the digital version of Serious Sam HD: The First & Second Encounters and The Serious Sam Collection. These compilations are also delisted. The First Encounter was delisted as Mastertronic Group went into Administration in November of 2015. As of April 2016 the demo version remains available on Xbox Live Arcade. Continue reading for the whole story. “The classic arcade FPS Serious Sam: The First Encounter, which scored an overall of 87% on Metacritic and was awarded Game of The Year 2001 on Gamespot, is now reborn in glorious high-definition for legions of long-time fans and a whole new generation of gamers around the world.